The Hive Café celebrated its opening on April 20, a major step for a project that has been in the works for over a year now. The café, located above Loyola Campus’ main cafeteria, plans to offer affordable and sustainable food options for Concordia students come September. 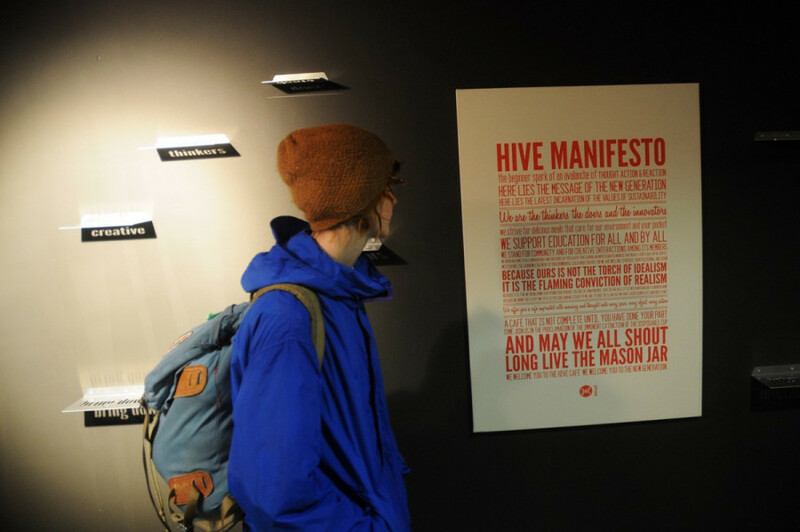 This year, students from a DART 392 class worked to design everything from the café‘s logo to the manifesto. The class focused on creating sustainable work, including a bin for compost and a heavy emphasis on a Mason jar trading program to replace disposable coffee cups. Kain also helped organize a menu contest, where visitors to the site can submit original recipes. A panel of judges, including local chefs, will choose their favourites and the Hive will feature the winning dishes on their menu. Each month, the café aims to feature a different theme, where certain related foods and drinks will be emphasized. Every theme, however, will offer food that is environmentally friendly while still addressing the tight budgets of most students. Cameron Stiff, a Concordia graduate and the coordinator of the project, said he believes these are the things the Loyola community is lacking. During his time as an undergrad, Stiff recalled wondering why the Hive wasn’t used for something more. “I looked at this place and thought, ‘What do you mean, there’s no campus bar?,’” Stiff said. Although he’s excited for the local opportunities the café will offer, Stiff sees the project as part of a larger picture. “This is a result of the conversation, a result of the dialogue, about the kind of world we want to live in,” he said.